The Illinois Trial Lawyers Association (ITLA) recently announced that our firm’s founding Partner, Joseph A. Power, Jr., will receive the Leonard M. Ring Lifetime Achievement Award at the ITLA convention on Friday, June 8th. ITLA has selected one recipient for this award every year since 1994. Power, Jr. was selected for a variety of reasons, including his incredible track record in the courtroom, his impact on the legal community, his philanthropic endeavors, his dedication to his clients, firm, and more. You can read more about his long list of accomplishments in ITLA’s press release here. 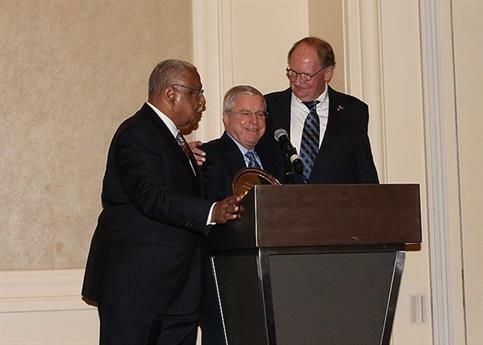 Joseph R. Power Jr. (center) receives the Illinois Trial Lawyers Association’s Leonard Ring Lifetime Achievement Award while being congratulated by fellow Power Rogers & Smith, L.L.P. partner Larry R. Rogers Sr. (left) and Thomas Q. Keefe Jr (right). If you are looking to discuss your case with one of the Chicago lawyers at Power Rogers & Smith, L.L.P., we encourage you to give our firm a call at (312) 313-0202 today, or to fill out our online form to schedule a free case evaluation. We have spent decades working with injured victims and through our efforts have secured more than $4 billion in verdicts and settlements. When you work with us, you can rest assured that your case is in good hands.